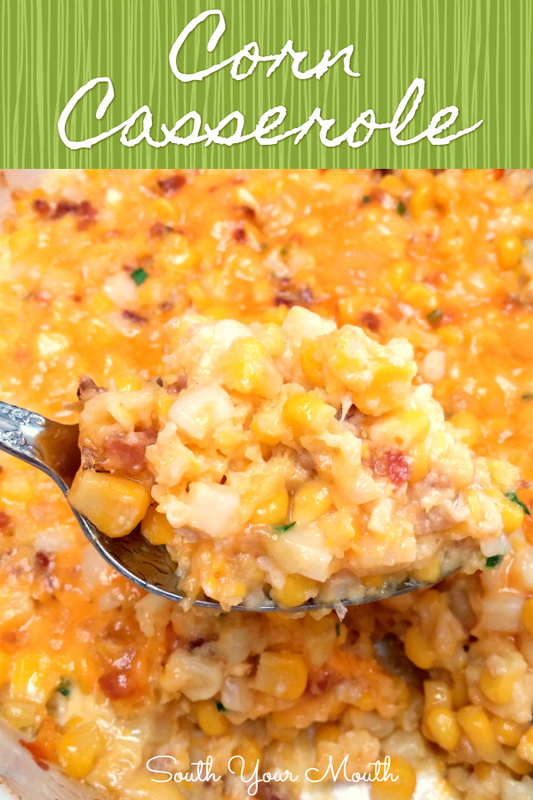 This easy corn casserole recipe dish comes together quickly with just corn, butter, cheddar cheese, bacon, a little flour, eggs and chives! 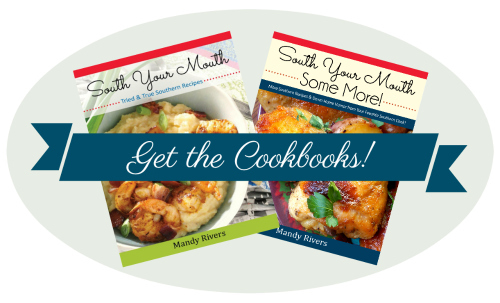 Since I started the blog I've been asked at least 947 times if I had a recipe for corn casserole. Y’all. I don’t even know what corn casserole is. Until you started asking me about it, I’d never heard of it. That is not a thing where I live. So when Mama told me she was making one for Easter I just about hit the floor. Do you ever wonder how your mama just knows stuff? Like, how did she know I’d been thinking about trying corn casserole? How did she know it’s been on my radar for years now and I'd been looking for a reason to experiment with it? How did she know?? I immediately started interrogating her. How did you know I wanted to make this? Have you ever heard of this before? Have you had this recipe the whole time? Have you ever cooked this before and I just don’t remember it? What? How? What? To which she responded with something along the lines of: your meat-and-potatoes Canadian husband won’t eat any green vegetables and I’m tired of making mashed potatoes for him every holiday because he doesn't like our Southern side dishes so when I saw this recipe in the Publix flier I thought it might be something he’d like plus this has bacon and cheese in it so you know the kids will love it because your kids have a very bizarre obsession with bacon. So guess what? It was amazing! I don’t know what corn casseroles are supposed to taste like but I do know that this was delicious! The contrasts in flavor and texture were perfect. 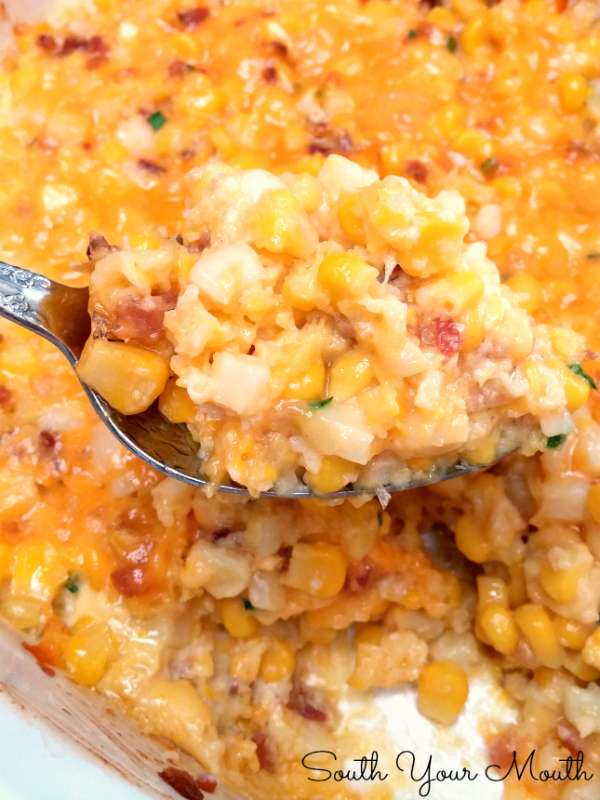 The salty, smoky bacon balances the sweetness and the gooey, cheesy filling is perfect with the crispness of the corn. I've seen some that have more flour (cornmeal, cornbread mix, etc.) and those look yummy too but I think I’ll always like this one better because the corn is still the star of the show. Add 2 cups of corn, eggs, flour, sugar, cayenne and butter to a blender or food processor and pulse 3-4 times to mix well and cream corn. Pour mixture into a medium bowl. Add remaining corn, 3/4 of the cheese, bacon and chives then stir well. Pour mixture into a greased 2-quart shallow baking dish then sprinkle with remaining cheese. Bake, uncovered, at 325 degrees for 30-35 minutes or until golden brown and bubbly around edges. I'm going to have to try this one. I've always made mine with just yellow rice instead of flour. But I've never added bacon or cayenne pepper. Is it the same? Except we use canned whole corn and cream style mixed with eggs cheese and flour and cinnamon and sugar. Do you think i could use canned corn ?? I really want to try this . This is delicious. Publix had it advertised in their circular last week with their whole Easter meal, and I made it...turned out great! 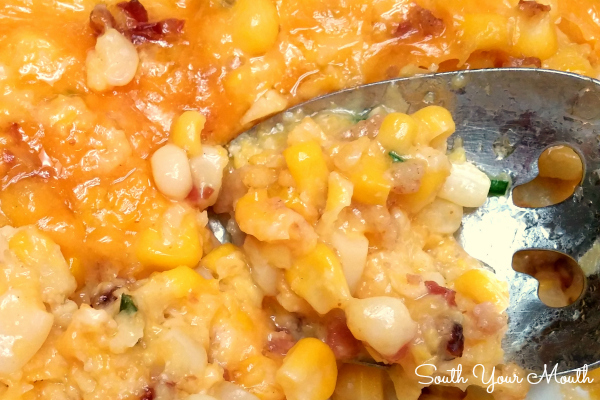 This corn casserole is just perfect! Corn and cheese really look good together. Just by looking, I could tell that it's delicious. Definitely going to make this. YUM! I made this tonight along with One-Pan Roasted Chicken and Potato Bake from this site. Both were a huge hit. I probably won't add the sugar next time because I don't care for super sweet corn (in my day there was no such thing as super sweet corn), I did reduce the sugar to 1 tablespoon but honestly, imo it doesn't need it period! I will definitely be making both again! Very tasty!! Thank you Mandy, the picture is what captivated me to try this recipe and I'm glad I did! Oh and we drizzled some Cajun hot sauce over it (Slap Ya Mama - our favorite) and it just upped the game! My Pennsylvania Dutch Mom made something very similar when I was growing up but we called it scalloped corn. Sooooo good! It thickens it and gives it a little body. Try 1 tablespoon of corn starch (don't use 1/4 cup). This looks porktastic! I can't wait to make it for the the hogfarmer hubby! Any casserole without a "gross can of something" gets 5 stars from me!!! Looks deliciousssss!! 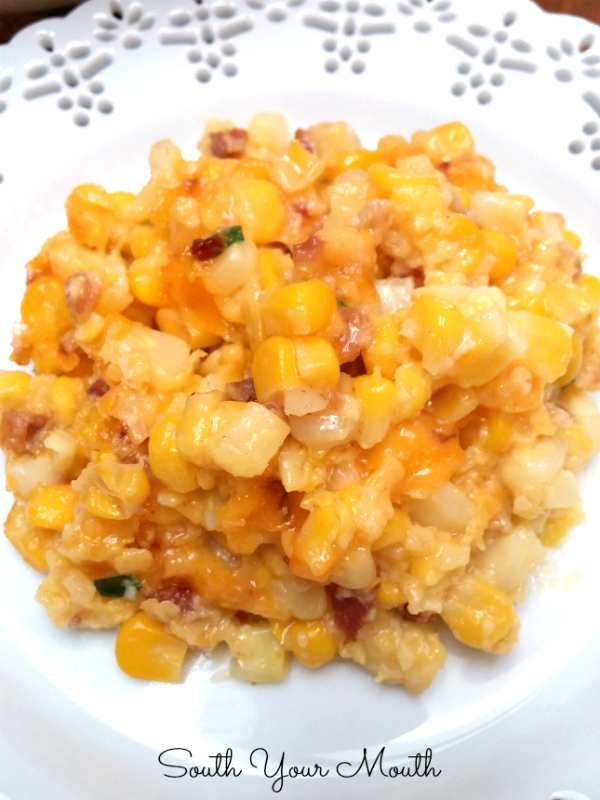 My mother made what she called scalloped corn which I always loved and it is the one recipe I can't seem to make as it never turns out like hers. She used canned corn (not creamed)drained. A layer of corn then some crushed soda crackers then another layer of corn then crushed crackers for the top layer then she added milk around the edges then baked it until it was hot and the crackers starting to brown. It was delicious. I think my mistake is in adding the milk I am either adding to much or not enough....I just know it never tastes like mom's. To me that is a bummer. Can you prep this a day ahead? I'm really not sure. I don't think the corn would keep its crispness. , or use it frozen? 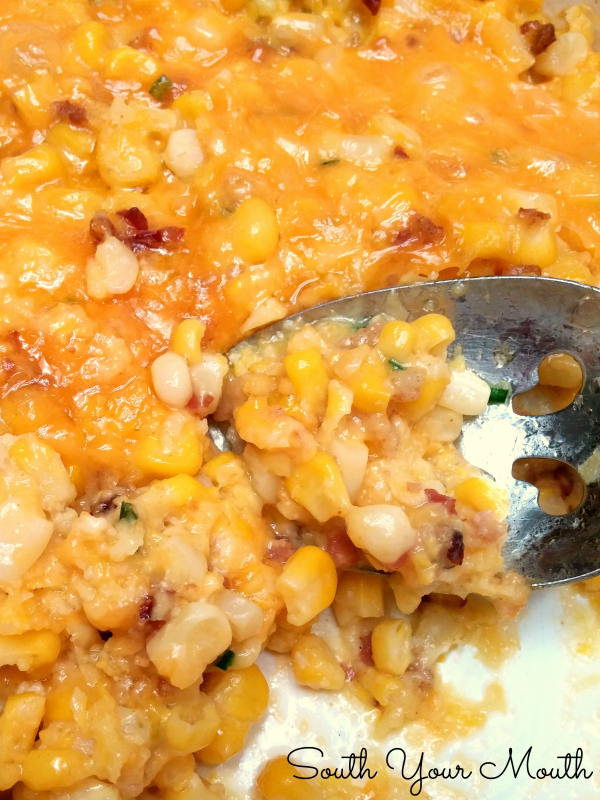 I just took my first bite of this Corn Casserole with cheese and bacon!One word...YUMMMMMMY! I pretty much followed the recipe exactly, which is different for me! I don't have a food procesor, so I used a whisk and smashed the corn! This is gluten - free right? Thanks! Thank you for this yummy recipe, big hit this Thanksgiving!!!! I wonder if a tub of sour cream would be good in this? ?